For developing any RF or microwave product, it must go through appropriate power measurements in its testing phase. These measurements are possible by using a device known as an RF power sensor. There are several methods of measuring RF power. Every method has its own advantages and disadvantages. Depending on these methods and the signal that needs to be measured, the particular type of RF power sensor would be used. Few RF power sensor technologies will be more suitable for measuring low signal power while others would be suitable for high power measurements. Choosing a particular power sensor could be quite complicated as newer and newer functions have been added in recent devices (Radio-Electronics, RF & MICROWAVE POWER SENSOR TYPES, nd). To make it easier for you to understand how these machines work, read the following points. The RF sensor based on diode detectors uses diode rectifiers in order to produce an output. The RF power sensors using these diodes make it possible for the RF power to get dissipated in a load. The detector then rectifies the voltage signal that appears across the load. This ultimately makes it possible to determine the power level entering the load. Diode based electrodes have two benefits. The first one involves their ability to measure low powers. Some of these diode based RF sensors can measure power levels as less as -70 dBm. This value is quite lower as compared to the measurements done by using heat based sensors. The second benefit of these sensors involves their ability to respond quicker to signals as compared to the heat based ones. The heat based sensors dissipate power from a source in a load. This is followed by the resulting temperature being measured. The advantages of these sensors are that they measure the true average power of the heat that is dissipated in the form of a power integral input over time. 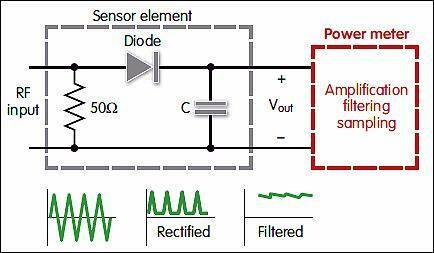 Simply aids, this power sensor measures the RF power limit of a signal, regardless of its waveform. There mainly are two types of heat based sensors: Thermistor RF power sensors and thermocouple RF power sensors. The former ones can enable DC power to get substituted so that the system can be properly calibrated. The thermistor power sensors make use if the principle that the rise in temperature can happen due to heat caused by radio frequencies passing through the medium used. In contrast, the thermocouple power sensors take into account the square-law characteristic. This indicates the input RF power to be proportional to DC output voltage from the thermocouple sensor. Even though these are the basic power sensor variations, before your business needs to invest in these devices you need to see consider few other factors. These primarily include the manufacturer reputability, sensor ranges, cost, availability, etc. Carry out an extensive research before settling on a particular product.